Sorry! I'm a day late with this review as well. I completely failed to get it posted before ep 2.9 aired yesterday. In my defense, this particular review turned out to be about twice the length of most of the other review posts. I appear to have had a lot to say about this episode. I'm really going to try to get the review post for ep 2.9 up before 2.10, but going by current evidence, I'm not promising! The episode gets going with a lot of information very quickly. We start with Hercules going to see Medusa at the hunting lodge in the woods where she is hiding out, and where she is crying and clearly terrified that she is cursed forever for having killed The Oracle. No matter how much Hercules tries to comfort her, there’s not much he can really say to counter that. Then, equally quickly, we see the bronze bull being prepared, and Pythagoras informing Jason of what is going to happen. 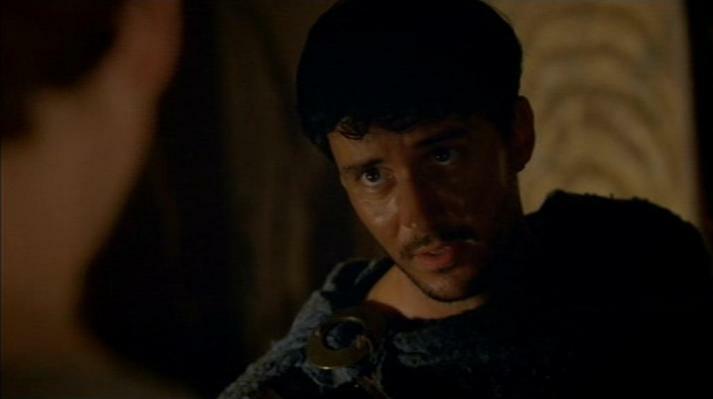 Jason looks shocked – the bronze bull is only for, “traitors and people who have betrayed Atlantis”. Apparently, Melas has decided that killing The Oracle and blaspheming the gods counts. We also discover the reason why Melas was so ready to betray Jason and Ariadne – Pasiphae is holding Cassandra, the young trainee Oracle hostage. Melas has sworn to protect her with his life, and is now Pasiphae’s pawn as long as she holds the girl. You can’t help but think that if the girl was so important, she ought to have been better guarded in the first place! At this point, though, I have to ask - why the bull? 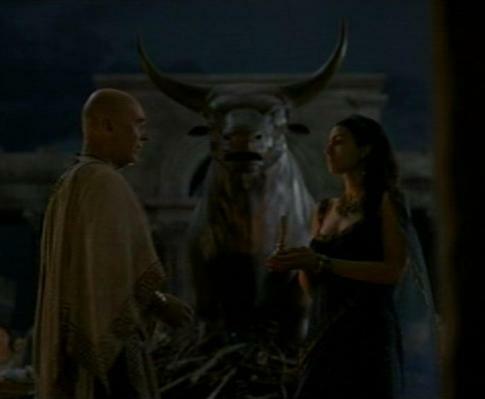 We now know that Melas is being forced to arrange a situation where Jason will die, and he is under duress, but why does he have to die in the bronze bull? It seems that Melas himself is the one who chose the punishment, and several people were surprised that it was the bull, as that is, apparently, reserved only for the most terrible of traitors. Arguing that what Jason is alleged to have done is treachery seems a long shot. 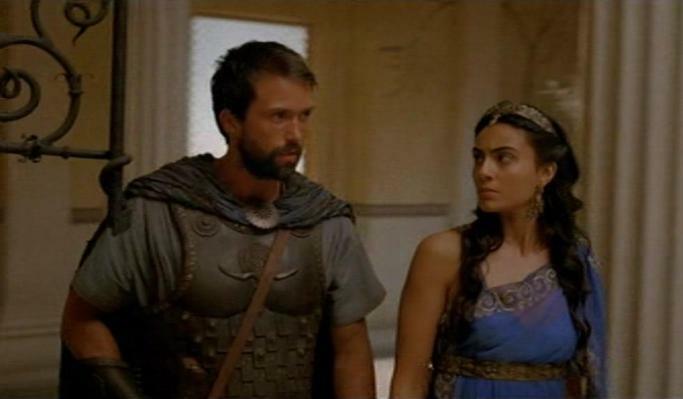 But more importantly, Melas has always been supportive of Jason and Ariadne in the past. Yes, we know that he is under duress to make sure that Jason dies, but if he still cares at all for them, surely he could choose another method of execution, something quicker and less agonising, something other than, as Pythagoras describes it, “the cruellest of deaths,”? Perhaps it is Pasiphae who is pushing for the bull as opposed to any other punishment, since Melas at one point argues to Pasiphae that it is a ‘cruel death’. But even for Pasiphae that seems unnecessarily cruel. She just wants Jason dead and out of the way, so surely any form of death will do the trick? Why insist on the bronze bull? When you add Hercules into the situation, it makes even less sense for him to be sentenced to the bull as well. I can’t help but think that either the scriptwriters really wanted to ramp the stakes up, or possibly they still had the big bull prop from series 1 and wanted to get their money’s worth out of it! Either way, like a few too many plots in Atlantis, if you poke it a little too hard with common sense and narrative logic is begins to waver rather alarmingly. Ariadne is clearly in a difficult position, with Melas constantly throwing thinly veiled threats about blaspheming and challenging the word of the gods (which, since he speaks for the gods, basically means challenging *him*). Pythagoras and Hercules were obviously hoping, possibly even expecting Ariadne to listen to them and release Jason when they go to petition her on Jason’s behalf. Considering how much they have done for Ariadne throughout the series so far, it’s not an unreasonable assumption that as queen, she would be able to influence events in their favour. And yet she refuses to change the sentence, Hercules is warned off ‘blaspheming’ when he insists that Jason is innocent of the crime, against the word of the gods, and they are unable to produce Medusa to testify to Jason’s innocence, so Ariadne’s answer is unequivocal – “there can be no clemency, only justice”. It’s strange that when Jason hears of this, his first reaction is to wonder whether Ariadne ever loved him at all. Why does love have anything to do with it? They all worked out in last week’s episode that Melas was the one who was manipulating everything, so surely the first assumption ought to have been that Ariadne was being coerced into going along with the judgement (which is actually the case, more or less). And yet Jason immediately brings it down to whether or not she loves him, because surely if she loves him she won’t let this happen. That’s either an awful lot of faith in Ariadne, or an extremely naive and selfish viewpoint. One question is why Pythagoras hasn’t tried to speak to Ariadne alone? He worked out in the last episode that Melas was the traitor, so why doesn’t he take his thoughts to Ariadne in private to let her know of the danger? Ariadne had probably already worked it out for herself by that point as well anyway, but if they had got their heads together they could have brought a convincing case against Melas, or attempted to work around Melas to save Jason. But there is no evidence that either Pythagoras or Hercules sought a private audience with Ariadne, and their petition happens in front of several nobles, where Ariadne has to be seen to be upholding the law and not granting special favour. The emotional plot gets even thicker when Hercules finally admits to Pythagoras that he knows where Medusa is. As I suspected last week, Pythagoras’ first reaction is to offer up Medusa in order to save Jason. As he so bluntly puts it to poor Hercules, “It’s either her or Jason.” Hercules has already been wrestling with this knowledge for what must be a day or two by this point, and the pain of being forced to choose is written all over his face. Pythagoras is unexpectedly blunt and unsympathetic considering this is Hercules, and considering how much this is obviously difficult for him. But all Pythagoras seems to be able to see is a way to save Jason no matter what the cost. 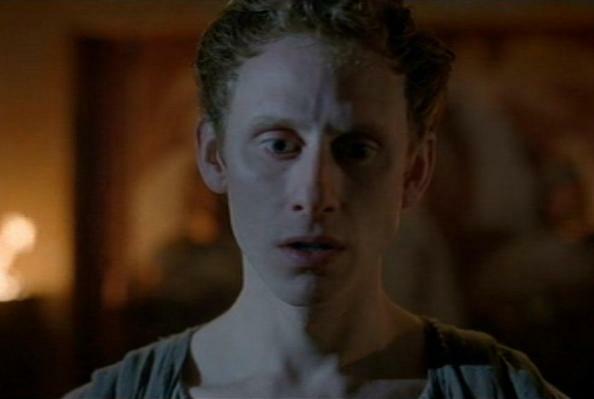 I know series 2 has been darker and the relationships more serious and adult, but whatever happened to the series 1 Pythagoras who clearly spent a lot of his time taking care of Hercules and who devoted a lot of effort to Hercules’ happiness and wellbeing? He doesn’t remind Hercules of The Oracle’s prophesy that the two of them are charged with protecting Jason, but perhaps it is in the back of his mind, and constitutes enough of a reason why he is so ready to give up Medusa. Or perhaps it is simply a sign of how much stress Pythagoras is under right then, that he will jump on any possible way of saving Jason, no matter who else gets hurt. 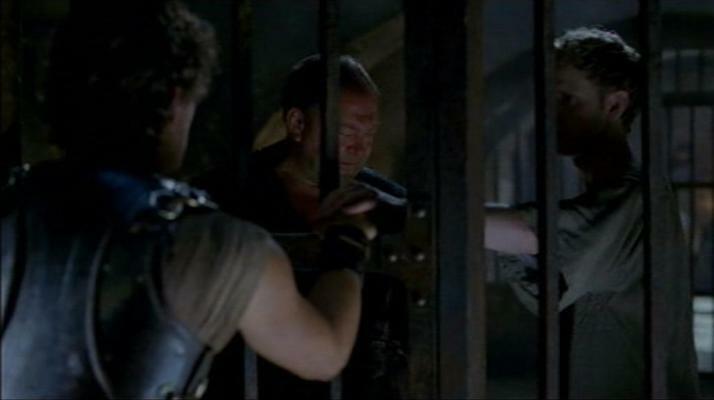 Hercules agrees to go and tell Medusa the truth (she doesn’t know that Jason is under a sentence of death), but in the end he cannot do it. 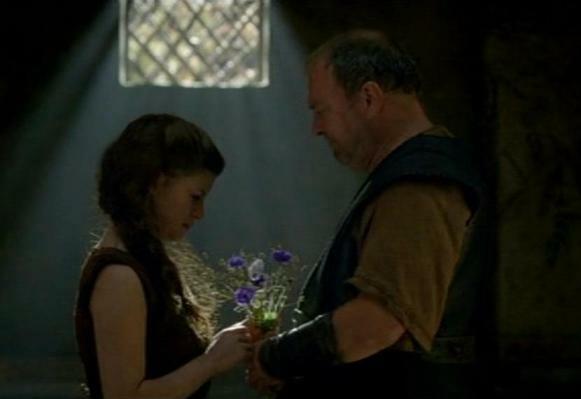 The scenes between Hercules and Medusa here, and throughout the episode, are beautifully and heartbreakingly played by both Mark Addy and Jemima Rooper. 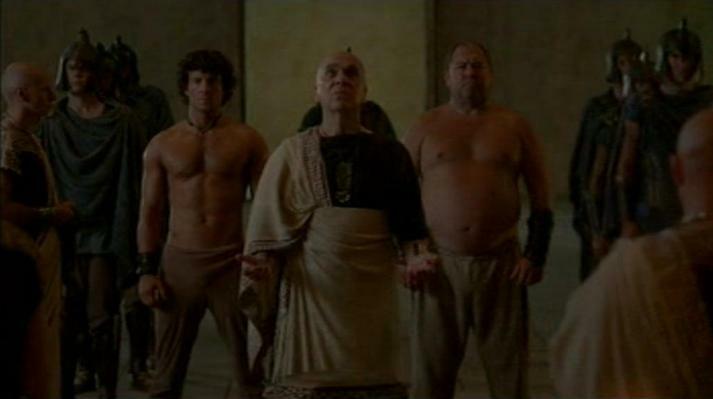 The return of Critias, Hercules’ old gambling friend from episode 2.1 and 2.2, and the reveal that their barroom brawl was actually a well-planned strategy to get Hercules into the cells is a fun and welcome moment in an episode which is largely dark and angsty and full of difficult decisions. It’s actually interesting that Pythagoras himself is not arrested, or suspected of being part of the rescue attempt at this point. 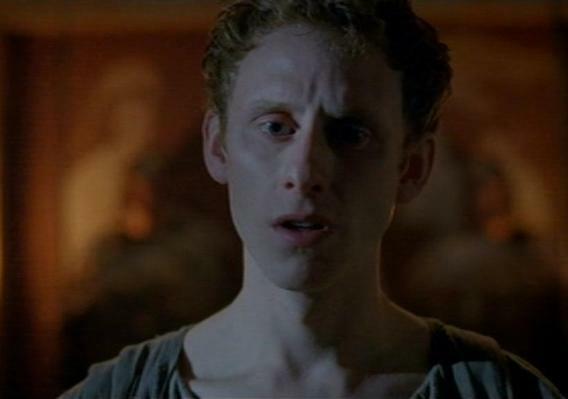 Of course, the plot demands that he remains at large in the city for later, but everyone at court knows that the three of them are generally all in these things together, so the fact that it is never even suggested that Pythagoras might have also had a hand in the failed rescue is odd. Perhaps Ariadne, or even Delmos, pulled a few hasty strings on his behalf? 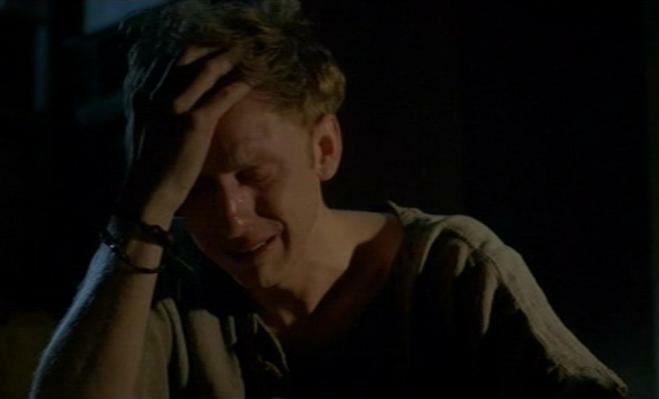 The montage of Hercules and Jason being prepared for their execution, and of Pythagoras at home, alone, breaking down at the thought of losing the two people he loves most in the world is very moving, not least because of the awesome music score that accompanies some fine acting. It’s worth noting, also, Pythagoras’ reaction here compared with his reaction in episode 1.1 when he was the one under a sentence of death for the following day with the Minotaur. Again, you could argue that it is down to the change in tone between series 1 and 2, but when faced with his own impending death sentence, Pythagoras was calm and collected, he even tried to joke with his friends at his ‘last supper’. 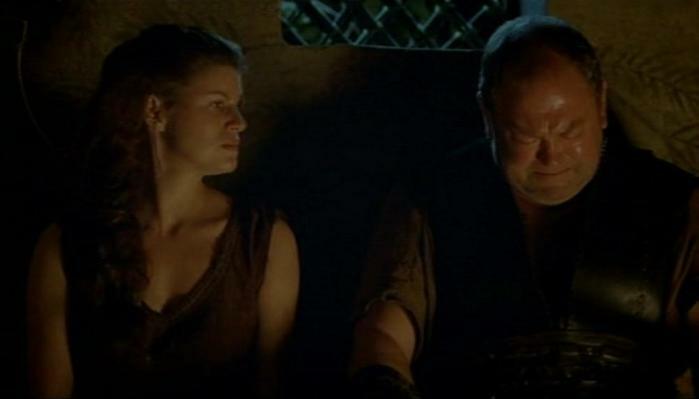 Here, when faced with the death of Hercules and Jason, he breaks down utterly in a way that we have never seen any of the main characters do in the entire history of the show. Perhaps this scene, more than any other, goes to explain why Pythagoras is so willing to sacrifice Medusa to save Jason and Hercules? And then suddenly the episode seems to shift gear. From a position of apparent hopelessness, Delmos and Ariadne engineer a surprisingly easy escape for Jason and Hercules, and Delmos ropes in Pythagoras to assist getting his friends out of the city (as well as a rather cute young soldier, ?Nestor?). Why doesn’t Pythagoras go with them straight away? Why does he remain in Atlantis while Hercules and Jason escape? Perhaps he initially stays to act as a distraction and keep the city guards occupied while the others are escaping, which he does rather effectively. But again, everyone in the city knows who they are, so when Pythagoras then goes home again afterwards, why don’t a bunch of guards turn up at the house to arrest him? It’s a welcome opportunity for Pythagoras to get some action scenes by himself, but again makes very little sense if you poke it too hard. Cilix blackmails Melas to make it known that the gods disapprove of the escape, no matter what the omens actually say. Surely the gods would take a dim view of Melas effectively lying, ‘blaspheming’ as this episode is so keen to keep emphasising? If Melas truly believes in the power of Poseidon (which, as a high priest of Poseidon, you’d better bloody well hope he does), then surely he ought to be pretty terrified of incurring the wrath of the gods for everything that he is doing at this point? Unless this is a very subtle hint that, actually, there are those who don’t believe that the gods can directly intervene on Earth, and it’s all smoke and mirrors? That’s... an unexpected take on society, given this is Greek mythology, where gods actually manifesting on earth in disguise or otherwise is a fairy regular occurrence. The scene in the council is yet another artful manipulation of the situation, and accusations of ‘blasphemy’ are again used, this time to bring Ariadne herself down. At this point I began to have serious issues with the way this episode was doing things. Firstly, the massive over-use of ‘blasphemy’ suddenly began to feel like the scriptwriters’ get-out clause for everything, especially considering the blatant and highly convenient situation of ‘swearing on the golden bull’, something we have never seen before in the show. When Ariadne is asked to swear on the bull that she had no part in Jason’s escape, she won’t for fear of blaspheming, whereas Melas is ‘exempt’ from having to swear on the bull because he is high priest. Surely someone, at some point, ought to have noticed that is a really big opportunity for priests to be corrupt? But I’m even more bothered about the council itself. The fact that it even exists, and appears to have the power to arrest the queen is utterly unheard of, in either the canon of the show itself, or in Greek mythology in general. When Minos was king there was no sense of him having a council. Advisors, perhaps. Nobles to whom he paid attention. But he was king, and his word was incontestable. 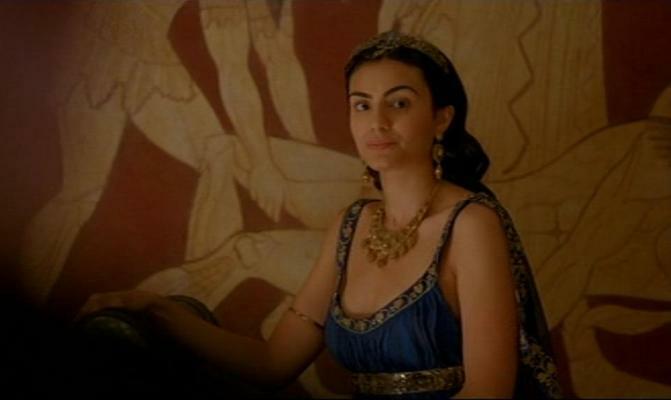 There has been talk in several episodes in series 2 about Ariadne needing the support of the noble families, and it is true that in Greek mythology in general, the ruler only remained the ruler as long as they could hold the throne either by common consent and support, or by might (that is why there are no queens ruling without a king in the myths). Ariadne clearly cannot hold it by might, so perhaps the support of the nobles is necessary. But at the same time, this concept of a council who can depose the queen, Queen Ariadne who is a goddess on earth, Poseidon’s daughter, etc etc... how? In what way do they have the power to do that? If they wanted to overthrow her, they could kill her, but surely they cannot take her off the throne as long as she is still alive? Delmos does indeed argue that the council does not have the power to judge the queen, but Cilix then neatly says that it is not the council who passes judgement; it is the gods (and conveniently gets the nod from Melas). But again, based on Greek mythology, if the gods had been offended then it was more than in their power to come down to earth and strike down the person who offended them. It is not for the people to pass judgement, especially not on someone who is in such a position of power as Ariadne. I know the arguments here largely fall into the category of 1) the plot requires Ariadne to be imprisoned and to not be killed, and 2) the world of Atlantis is a fantasy world that borrows from mythology, without necessarily being a true representation of the world described in the Greek ‘heroic age’. But I have to admit I found myself having to suspend a little bit too much disbelief in order for the plot of this episode to work at all. Which is a shame. So, Pythagoras finds the others, avoiding several city guards along the way, and tells them the news. And again, immediately, he turns to Hercules and says that there is one way to save Ariadne, and by extension Jason (who was all set to go off and do something stupidly reckless in an attempt to save Ariadne). Pythagoras really isn’t doing sympathy or understanding on the subject of Medusa. I’m actually a little annoyed and disappointed at how quick all three of the boys are to give up Medusa. No matter what she did to The Oracle, let’s not forget that Medusa is someone who the boys were close friends with in series 1, and who helped them and got them out of trouble and saved their lives on more than one occasion. 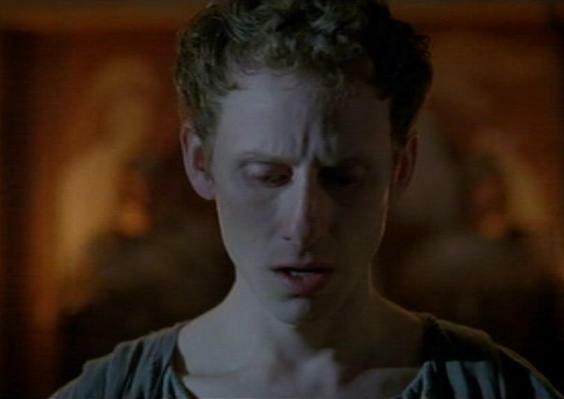 Jason is obviously only thinking of saving Ariadne, and Pythagoras seems to be only thinking of saving Jason. That Hercules gives in to them both so easily is far more inexplicable. Perhaps he has, by now, had a few days to get used to the idea, and has slowly come to accept that it might be the only way. But there is no sign that they even attempt to brainstorm any alternatives. They immediately jump to the ‘sacrifice Medusa to save Jason and Ariadne’ option. Even with the darker tone and moral grey areas of series 2, that seems unnecessarily harsh. These are supposed to be the ‘good guys’, after all. Also, I have to point out that by the time Ariadne has been arrested, surely playing the Medusa card is too little too late? Bringing Medusa forward to testify and prove Jason’s innocence would have worked a few days earlier, when Ariadne was still in power, and she could have argued Melas and Cilix down, and possibly even exposed them, in the face of evidence and/or a sworn confession that Jason did not kill The Oracle. Producing Medusa now is useless, because the only people in a position to hear the confession and see the ‘evidence’ are the very people who have fabricated the entire plot in the first place, so they’re not going to listen. Horse. Stable door. Regardless, Medusa accepts her fate extremely calmly, and immediately decided she must give herself up to save her friends. Earlier in the episode we saw Medusa distraught that she is now cursed by the gods because she killed the Oracle, and she has always been brave and selfless, so it’s entirely likely that she would always have sacrificed herself, given the option. The only reason she didn’t give herself up earlier was because she didn’t know the severity of the situation. Which, presumably, is precisely why Hercules deliberately neglected to tell her what was going on, because he knew what she would do, and he couldn’t bear to lose her (in much the same way that in series 1, episode 1.10, Pythagoras deliberately didn’t tell Hercules that he could save Medusa by sacrificing himself, because Pythagoras couldn’t bear to lose Hercules, so you’d think Pythagoras might have had a little more sympathy for his friend’s predicament here). They all return to Atlantis, only to discover that the throne has barely been vacant for less than a day and Pasiphae has already put herself on it. That was a surprise ending that was actually a surprise. This episode very definitely seemed like it was taking the plot into ‘the darkest hour’, and we can only hope that from here things might start to turn around as the gang plot and plan and figure out how to save Ariadne and take back Atlantis. Or it could just go even darker and even more morally ambiguous. 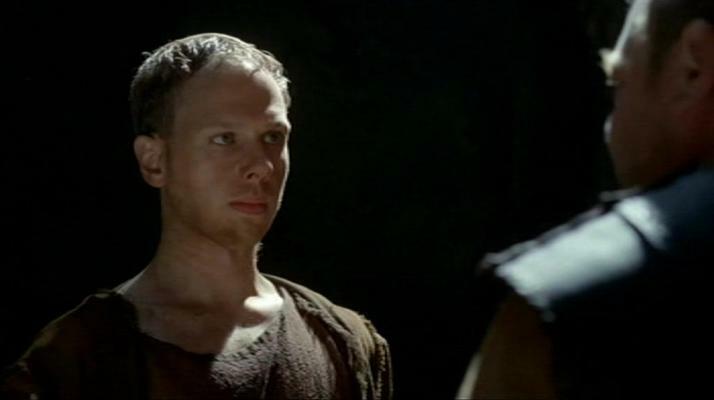 Anyone who read my review for last week’s episode will know I was looking forward to 2.8, largely because I was expecting far more in the way of emotional, heart-wrenching decision making from Hercules and Pythagoras (and, by extension, awesome acting from Mark and Robert). 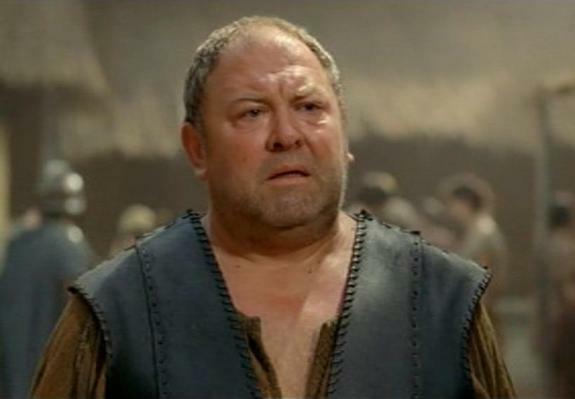 We got the awesome acting, Mark Addy yet again demonstrating how much pain you can convey without actually doing or saying an awful lot, and I might possibly have rewatched the ‘Pythagoras emotional meltdown’ scene several a few times. But as for complex emotional dilemmas – not so much. And as I have said, at length, above, the plot forced me to suspend disbelief a few times too many to accept where it needed me to go. It’s odd, because straight after my first watching of the episode, I e-mailed a friend and I believe my actual words were, “OMG, that was a bloody good episode”. It was certainly good enough that I had watched it twice before I went to bed on Saturday night. On initial watching, as long as you are being carried along by the plot, it works as a very good and dramatic episode, with a few surprise twists and turns along the way. But the more you rewatch it, and the more you stop to think about what actually happens, and how events are manipulated into happening, it begins to look a lot less impressive. I don’t want to say that I was disappointed with episode 2.8. Disappointed is too strong a word, because it was a good episode, despite its flaws. But a lot of the major plot developments seemed a little too contrived in order to force the plot in a certain way. Each individual instance of this, I might have accepted by itself within the general narrative flow. But all of those instances together in one episode was, sadly, asking just a little too much. It was good to see critias back (although it made me remember how we lost Dion) and even better seeing him getting away safely (I thought he might be the red shirt of the episode). Also it was great to see Delmos was loyal, but that was it, the rest of the episode was very angsty and sad (not a real complaint here). What felt slithgly wrong was Pyth's 'It's her or Jason' part. He was indeed blunt, unlike him. Maybe it was just to get to the point of the story, because a lot of things happened in the episode (the discussion about Medusa-or-Jason-or plan B, would have taken long, but I would have liked to see it anyway). Great review, as usual. I'm really dying to read the next one (good luck with that!). I really was surprised, and disappointed, by how much the boys seemed willing to sacrifice Medusa. She was their friend, a very good friend, in series 1. Have they forgotten her so easily? I guess now we've seen 2.9, that does redress the balance a bit, and shows them all together and working together again, but still. Perhaps it was just that there was so much plot to get into ep 2.8 they didn't have time to show them discussion other options. But it just seemed harsh. Oh, god I have no idea what the hell I'm going to do with the 2.9 review! If *this* one was unexpectedly long, The one for ep 9 is going to be *huge*. Maybe if I start writing it tomorrow, it might be done in time for next weekend! Yes, but the question is not whether I will manage it, and more whether I will manage it *in time*! Yes to all of that. I had a lot of problems with this episode, starting with Melas apparently betraying one Oracle for another. I was surprised by how little loyalty he had to the older Oracle, they had been through a lot together. I found Ariadne's aloofness quite cruel, surely she could have gotten word to Jason that she was forming a plan rather than let him believe she had abandoned him. The poor guy was about to be executed. And the ease with which Ariadne was thrown in prison was strange. Not a lot of love for this episode. I wish it had been better thought out. Thanks for the recap, always fun to read them. The entire thing with Melas bothers me. I'm not convinced that the kidnapping of Cassandra is a good enough reason for him to betray The Oracle, and the queen, and Jason, and, well, pretty much the entire city. There was a bit that seemed to imply that he hadn't known they intended to kill The Oracle, only to abduct her, but really, what did he *think* Paspiphae was going to do once she had The Oracle captive? I suppose Ariadne might have thought she couldn't get a message to Jason because if anyone else overheard or found out, or even suspected, she didn't know who she could trust. I get that she was in a terrible position and had to appear to be upholding the law, but the simple fact that she was maneuvered into that position in the first place is largely down to some incredibly dodgy plotting, and blatant overuse of 'blasphemy' as a catch all for anything that Melas and Cilix disagreed with. And don't even get me started on Cilix and Melas arresting Ariadne! It is a very good episode, and very well played by all the actors (especially Robert Emms, although to be fair, I am baised on that subject), but it only really holds together as long as you don't think about it too hard. If you do, an awful lot of the plot falls apart under even the most gentle poking! 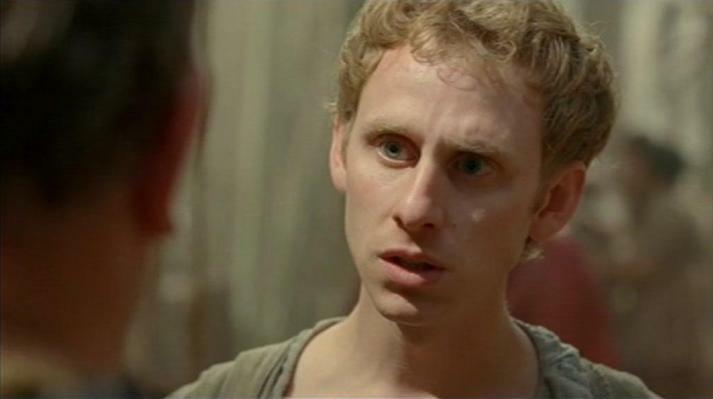 Sorry, I was a bit negative about this episode and forgot to mention how good Robert Emms was. He was heartbreakingly good. Robert Emms is one of the best actors on this show (and that's saying something when you've got the likes of Sarah Parish and Mark Addy in there as well), but he really absolutely nailed it in the last couple of episodes. I'm just annoyed it's taken them until this far into the series to give him any decent scripts to work with. God yes, this plot really didn't withstand much poking at all. Which was a shame, because in all other aspects it was excellent. PS. Sorry for the repeated edits. I must learn to proofread comments. Or not be bothered by typos.